This Cemetery was founded in 1849, though it is now closed, but we don't yet know when. 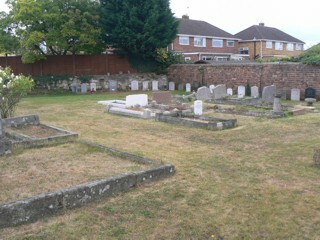 The Burial Ground is now all that remains on the site of the old Methodist Chapel in Hucclecote. The chapel was opened in 1849, but by the early 20th century, it had become unsafe and in 1929 it was replaced by a new Methodist Church in Carisbrooke Road. The Old Chapel was subsequently demolished, and the land it was on has been incorporated into the burial ground, but the datestone from the front of the building, inscribed 'Wesleyan Chapel - Erected 1848' survives - built into the retaining wall, facing the Burial Ground. The GPR holds 61 grave and 118 person records for the burial ground. There have been 18 requests for photographs from the burial ground.